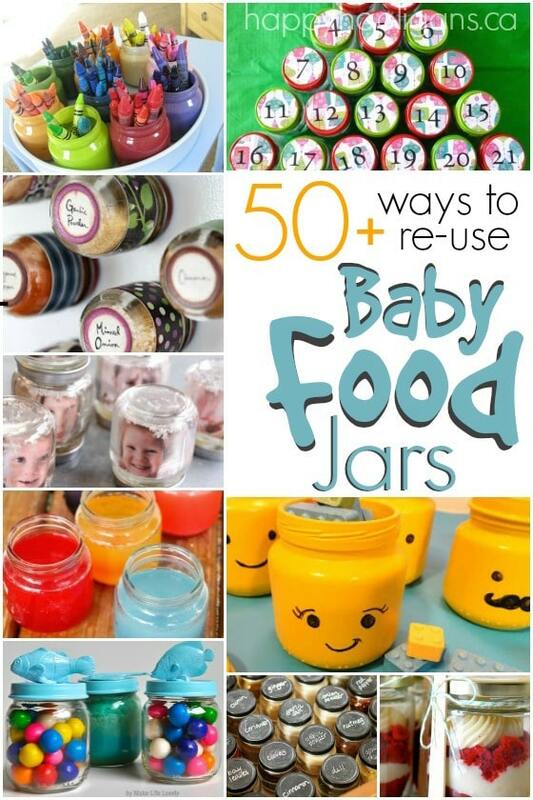 50+ baby food jar crafts and creative ways to re-use baby food jars so you don’t have to put throw them in the trash. If you’ve had a baby in recent years, there’s a good chance you’ve acquired quite a collection of baby food jars. Baby food jars ares so cute and chubby, and such a great size. If you’re like me, you find it hard to thrown them away. If that’s the case, your baby food jar collection could be growing at an alarming rate, and you’re probably looking for things to make with all of those jars. Well, you’re in luck! One of my Facebook followers recently asked for ways that she could re-purpose her baby food jars, and the HH community responded with dozens of great crafts made with baby food jars along with practical ways to use baby food jars in and around the home. I’ve gathered up their best suggestions and added a few of my own favourite uses for baby food jars, and I’ve come up with this long list of ideas for you. From the craft room to the classroom to the bathroom and beyond, here are over 50 ways for you to use leftover baby food jars so you don’t have to toss them out. Click on the links below to see project details. 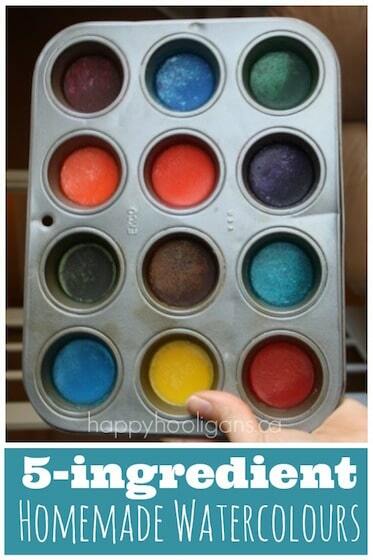 Crayon Caddy: Paint several baby food jars and store co-ordinating, coloured crayons in them. Fill baby food jars with water, and set on the art table to rinse paint brushes in. Give each student in the class a baby food jar filled with cream, and make homemade butter together. Make a mini “ocean in a jar” in a baby food jar. Pretty on classroom window sill or fun to play with. Soak dried out markers in baby food jars to make liquid watercolour paint. Make and store homemade finger paint in baby food jars. Baby food jars make great paint and glue pots at the easel. Lids keep them from drying out between uses. Punch holes in the lids (with a nail) and use jars to store and dispense glitter. Make I-Spy Jars in baby food jars. Make collection jars for the preschool classroom. Paint tall baby food jars with food coloring, water and glue for a frosted look. Store pens, pencils and paintbrushes in them. Play dough jars: fill several baby food jars with different colours of homemade play dough for a kids’ gift basket. 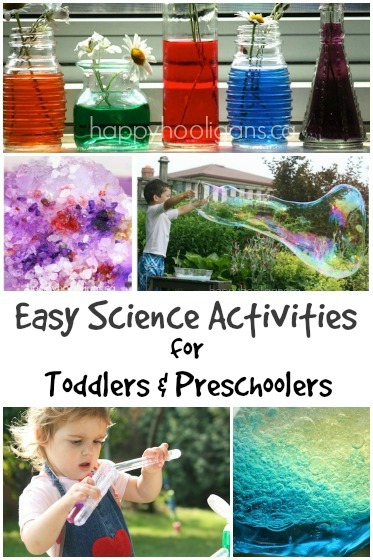 Set some baby food jars out in the rain and make this scented rain paint. 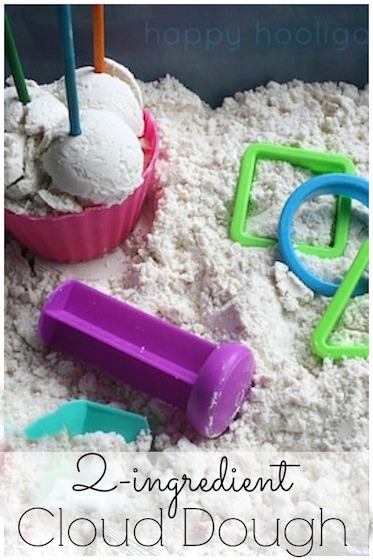 In the play kitchen: fill baby food jars with flour, rice, lentils etc. Glue the lids on, and kids can pretend-cook with them. Bug Jars – wrap a pipe cleaner handle around the top, and go exploring in the yard. Make these cute and quirky emoji jars for a kid’s dresser or desk. Glue painted toy animals on baby food jar lids, use as party favours. Fill with homemade slime or silly putty to put in loot bags. Make a tooth fairy jar. Teach kids how to manage their allowance with 3 tall baby food jars labeled SPEND, SAVE, BANK. Make an advent or countdown calendar. Fill baby food jars with layers of “coloured sand” (ground sidewalk chalk mixed with salt). Use baby food jars to make mini lava-lamps. Organize your spice drawer with baby food jars. Make Smore’s treats in baby food jars. Hand them out around the campfire or at a party. Make a window-sill herb garden with baby food jars. Fill baby food jars with condiments for camping or a bbq. Sterilize jars and lids, and reuse baby food jars for homemade baby food. The serving sizes are perfect. Baby food jars make great wedding favours. Decorate and place at each table setting. These baby food jar lanterns were hung in a tree at an outdoor wedding. Make Lego Head Jars as party favours for a Lego party. Make a wish jars or dream jars for your family and friends. Give a gift of homemade bath salts or sugar scrub in a baby food jar. Make these cupcakes in a jar to give to teachers, neighbours and friends. 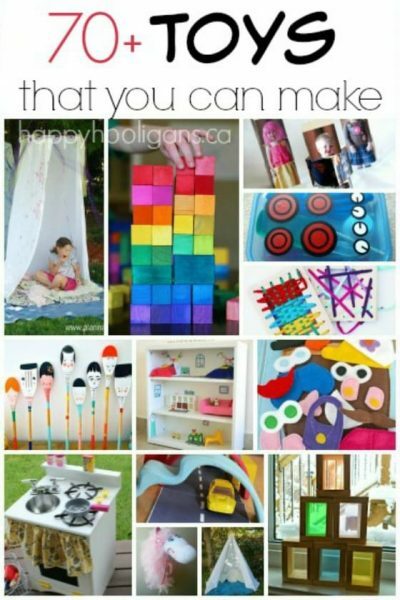 Make a craft kit for a child by filling jars with pom poms, sequins, foam stickers, and beads. Hot Cocoa in a baby food jar: layer hot chocolate, shaved chocolate and mini marshmallows in a jar. Cover the lid with a swatch of fabric tied with a ribbon. Store pony tail holders, Q-tips, and hair clips in baby food jars on the bathroom counter. Make a spill proof nail-polish remover kit with a baby food jar. Plant succulents in baby food jars to display on a porch or patio. Hang these colourful baby food luminaries from a tree in your yard. Baby food jars are great for storing seeds for the garden. Make Photo Globes by placing your child’s photo inside a baby food jar. Organize your spare change: each jar holds a different type of coin. Use baby food jars to hold paper clips, thumb tacks etc. on a desk or in a drawer in an office. Travel jewelry keeper for earrings and rings. A Mini sewing kit in a baby food jar is great for travel or the office. 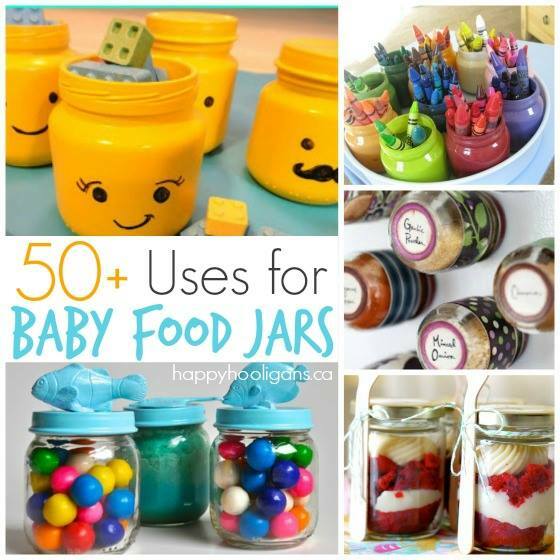 Fill baby food jars with Puffs, fishy crackers, Cheerios, nuts etc. Keep in the diaper bag for the kids. Nail the lids of baby food jars to the underside of a shelf to store screws, nails and craft supplies. Store several baby wipes in a baby food jar and keep in your purse or diaper bag. Turn a baby food jar into a snowman Christmas tree ornament. Make festive holiday votive candle holders. Make sparkly tea light luminaries in baby food jars. Baby food jars make great miniature snow globes. Make Reindeer food for Christmas Eve. What if you STILL have leftover baby food jars? If you have more baby food jars than you could possibly ever use, even after reviewing all of the ideas, please consider giving your collection to a teacher, a crafter or a daycare provider. Most will be happy to put your little glass jars to good use. Hey! Thanks for the shout out to our spice jars! I really like all the ideas here! You’re welcome, Adriane! I think your jars are brilliant! Thank you so much for featuring my Advent Calendar idea! I am looking forward to doing it again this year. My pleasure, Charlene! It’s such a great idea! How do u nake the mini lava lamps? If you google “DIY mini lava lamps”, you’ll find tutorials, Annie. Awesome ideas!! Reusing baby food jar is much better way than throwing them. 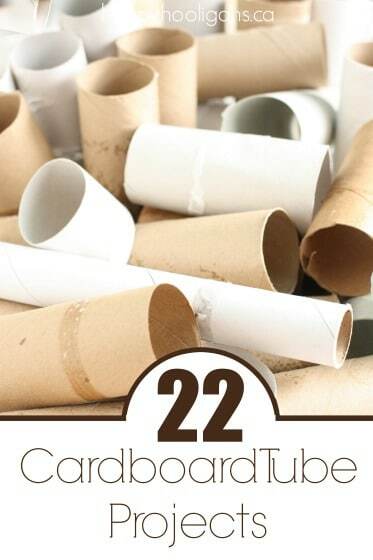 I have collected so many from them and was just looking for the best idea how to reuse them. Thanks for sharing all those smart ways!! I’m so glad you enjoyed these ideas, Evelyn!